Shrimp Named After Elton John Due to Its "Enlarged Appendage"
A marine biologist has identified a new species of shrimp and named it after his favorite rock star, Sir Elton John. Why? Because of the crustacean's "greatly enlarged appendage." While searching "Elton John shrimp news," some of you may have come across some interesting articles this morning - it seems the legendary British rock star is finally getting a miniature shrimp named after him. It's about time? 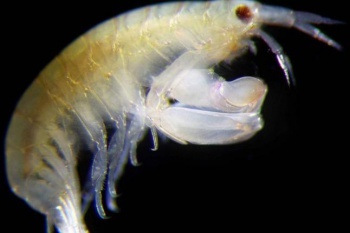 "I named the species in honor of Sir Elton John because I have listened to his music in my lab during my entire scientific career," says researcher James Thomas of Halmos College of Natural Sciences and Oceanography. His study is published in Zookeys. "So, when this unusual crustacean with a greatly enlarged appendage appeared under my microscope after a day of collecting, an image of the shoes Elton John wore as the Pinball Wizard came to mind." Yeah, alright - it makes a little bit more sense now. 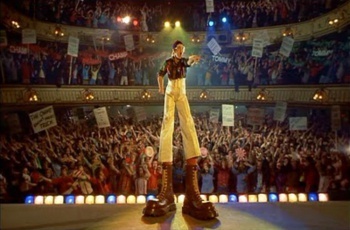 He's referencing The Who's movie, Tommy; Elton and his shoes are pictured below (and the music video, for reference). Is it cuter than Adorabilis, though? I think not. Leucothoe eltoni, though, is actually pretty interesting on its own: it was discovered hanging out in "the branchial chambers of solitary tunicates." In other words, a tube-like structure of another marine organism. Native to Indonesia (like last week's other celebrity crustacean), Sir Elton John is apparently an invasive species in Hawaii, having hitched a ride in a sponge attached a large floating drydock. Now if you'll excuse me, I've just realized my MP3 player doesn't have nearly enough Elton John on it.